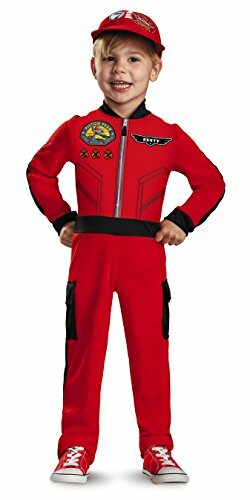 Halloween Costumes from Disney's Planes Fire and Rescue Have Landed! The Disney summer movie, Planes, has grossed millions of dollars at the box office and will earn the mega company millions more with all of the merchandise tied to the film. It's sequel, Planes: Fire and Rescue, the second film in the trilogy,, also earned the corporation a huge sum of money. Just like Cars, this movie is aimed at children, and boys in particular will be thrilled with it. There is a lot of action in the air, and children will be on the edge of their seats as they watch Dusty Crophopper, the low flying, under powered sharecropper plane, overcome his fears and go for the big win in the aerial race in which he is competing. He exhibits determination, motivation and a "can do" attitude. He is always practicing and training, because he has his eyes on the prize. Staying focused and on task, even when the odds seem insurmountable, is a terrific lesson for kids to learn. For children this age, the difficult tasks are learning to ride a two wheeler, staying in the lines while coloring and cutting a straight line with a pair of scissors. This quiet, gentle lesson is one that viewers are drawn to. This Dusty Halloween costume is a one piece jumpsuit that come with a matching hat. bright orange colors are perfect for Halloween, and the top of the outfit features a picture of Dusty with the words “Flight Crew” on it. Children are already in love with this character who refuses to give up on his dreams. That is a positive message for children of any age to receive. This two piece jumpsuit is a variation Dusty. It has lots of logos on the front and comes with a matching hat. If you want a newer version of Dusty, then here is a fun costume that appears to be three dimensional! The white shirt and black pants in the picture are not included, but certainly you have these at home! The vest-like overlay is made of foam and the wings and propeller jut out, giving the appearance of a third dimension. It is one size fits all. El Chupacabra-The Plane! The Myth! The Legend! Exactly what is true and what is a stretch of the truth is unknown to those who hang around this plane with a flair for the dramatic. But one thing Dusty knows for certain-EL CHu has his back. As his best friend in the movie, his "wing man", both do favors for each other because they are friends, and that is what friends do. He is Mexican, and has a passionate nature. Even his mask has a mask! El Chu is crushing on Rochelle, which is one of the movie’s subplots. He is voiced by Carlos Alazraqu, who many children will recognize from his other cartoon gigs, like Felipe in Handy Manny and King Magnus in Sofia the First. 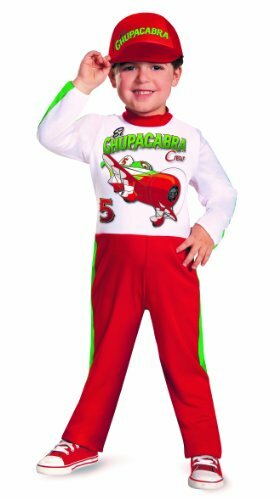 This El Chu costume is a red and white jumpsuit that comes with a red hat. It says in gree letters “El Chupacabra” and features a picture of him. Pair this up with some red socks and sneakers and you have a winning outfit! This is a one piece red and white jumpsuit. The hat is included. This is an inexpensive addition to your child's dress up box! Dressing up as a character from Disney's Planes series of films is a bona fide hit with young boys! Cute costumes! They would be great for Halloween coming up. I think they are adorable as well!